Hi everyone, it's been so long since I've posted! Lots of ongoing health issues in my family, so crafting had to be put on hold for a while. I'm on holidays now so can squeeze in some card making! I hope everyone had a happy Christmas and that 2017 is a great year for everyone! This was a quick and easy card to make, The hearts are diecut from a piece of watercolour paper, painted with Kuretake Gansai paints. The sentiment is from Annabelle Stamps, all framed with an embossing folder. I'm joining the Simon Says Stamp Wednesday anything goes challenge. Memory Box Sofia Heart die; Annabelle Stamps Weddings Medallion sentiment (now closed down); versafine ink & clear ep; Kuretake Gansai watercolours; Stately embossing folder. 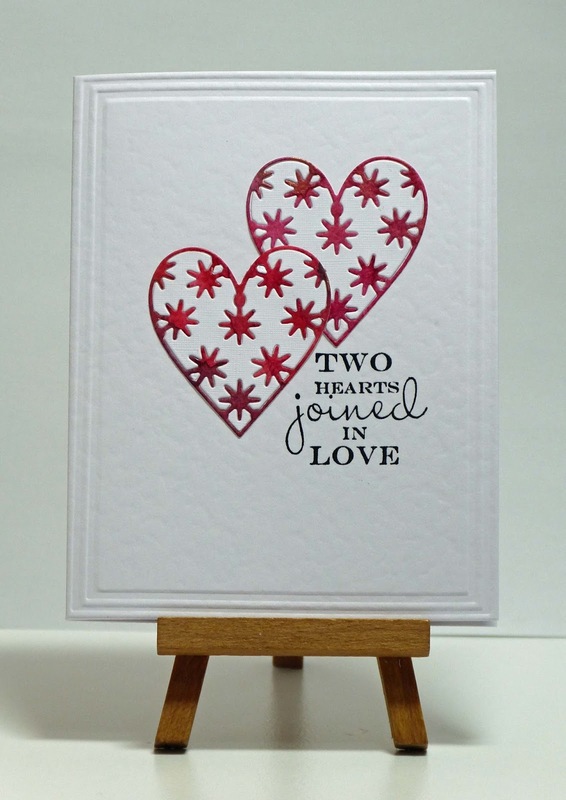 Love your card, perfect getting ready for Valentine's Day. I hope all the health issues have cleared up and everyone is well. Wishing you a very happy, healthy New Year to you and your family. Gorgeous card Cathy and I love the die you used so perfectly with that wonderful sentiment. Great Valentine's Day card! I love the look of these hearts. Visually they are convex, as if they had in thickness. as pillows in the shape of a heart. Great idea. I love anything with hearts and this is a special one, Cathy! Thank you for joining us at the Simon Says Stamp Wednesday challenge! Wonderful card Cathy. Love that framing with the embossing folder an added special touch. What a pretty card, perfect for an anniversary. Hope all the health issues are being resolved. This is such a wonderful card with a beautiful CAS design! I love those water colored hearts, and I'm so glad you found a little time to get crafty once again :) Happy New Year! Beautiful card. The hearts are so delicate and very pretty!